teeny-tiny baby caterpillars that just hatched from the dozens of eggs we have been collecting. 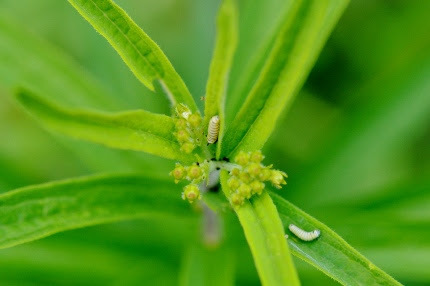 We are finding them on baby milkweed plants as well as various butterfly weed species and varieties throughout the nursery. 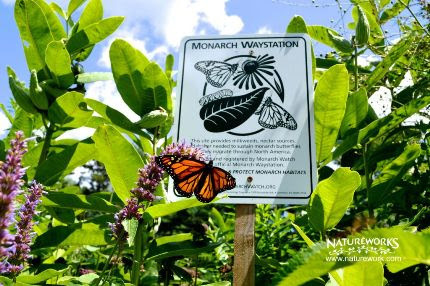 We are an official Monarch Waystation and the work that we are all doing to provide larval food and nectar for these endangered beauties is so important. One of our newly hatched butterflies nectaring on Agastache right in front of our sign! My yard, Diane’s yard, and Natureworks are all ABUZZ with life. I sit and watch in wonder- goldfinches on the self-sown sunflowers (they plant them each year by eating the seeds and dropping some), catbirds and mockingbirds building a second round of nests while training their babies to sing their repertoire of bird songs. Bees, wasps, and beneficial insects are absolutely everywhere, from the tiny to the giant, scary looking ones, all interested in one thing: my flowers. Even the weeds are host to these important creatures- my Queen Anne’s lace is simply crawling with pollinators and my mountain mint (Pycnanthemum muticum), well, there is so much life I should make a video. These flowers surround all of our food gardens and have everything to do with the great pollination and fruit set we are getting and the surprising lack of insects. I think the birds are eating the bugs before they can get a foothold! It truly is a magical ecosystem that we have created. It also forces me to stop working and just SIT and watch in wonder, something I need to do a lot more of right now. 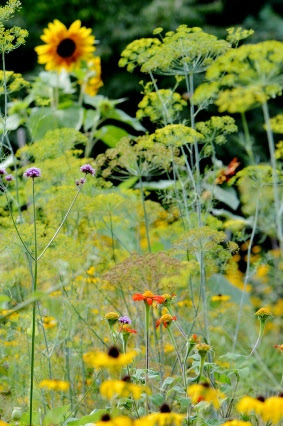 A melange of flowers and herbs surround Diane’s veggie beds. They are buzzing with life. Got elderberries? We do! On Monday I made elderberry liqueur. 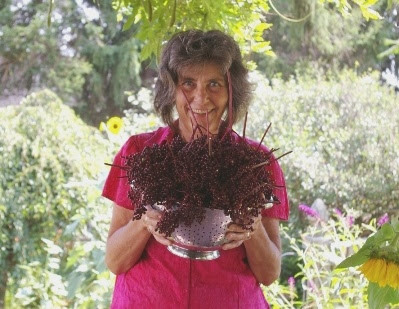 On Saturday, August 8th we will have a workshop on making elderberry syrup. Elderberries are a wonderful native shrub for humans AND birds! A week from Saturday I am thrilled to be hosting herbalist Terri Cusson at Natureworks. I met Terri through the CT Vegetable Gardening Group on Facebook. I could tell right away that she was a very experienced herbalist by her postings. Terri is going to teach us how to make elderberry syrup. This native shrub is in its glory right now, producing tons of fresh fruit beloved by birds… and humans! You have to pre-register for this event, the details are below. Don’t miss this! And then make sure to plant a few native elderberry bushes in your yard so you can grow your own for next year. Jude Hsiang’s beautiful fabrics dyed with all-natural plant dyes. 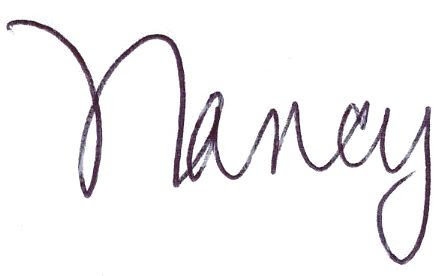 On Wednesday evening,August 12th, we are having another very special guest. 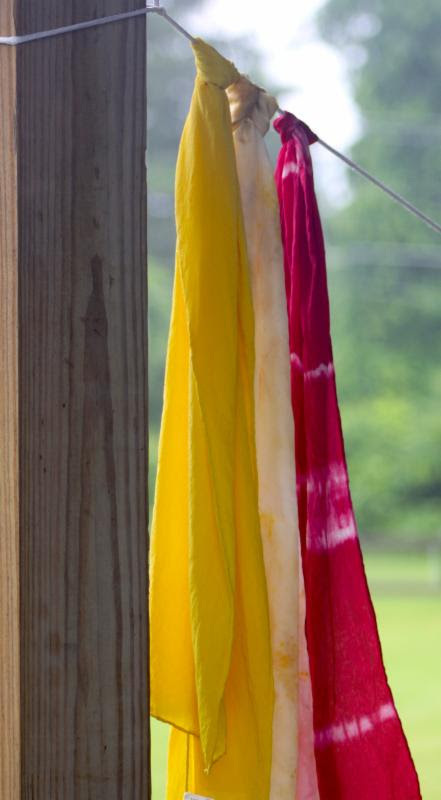 Jude Hsiang is coming to our teaching tent and will guide you through the process of dyeing a silk scarf using natural dyes from plant materials. This is just so exciting! Again, I have seen so many beautiful posts on Facebook that Jude has put up showing her work with plants and natural dyes. I am fascinated. To register, see the details below. What else is happening in August? A LOT! We are having a Saturday Fairy Festival, a couple of Produce Swaps, another Early Bird Sale, a Tomato Tasting, and a workshop on Monarch Butterflies. The August Calendar of Events is ready. Click below to download a copy and please share it with your friends. Can you spot the hummingbird on our feeder? Look closely. I saw a monarch AND a hummingbird at the same time! 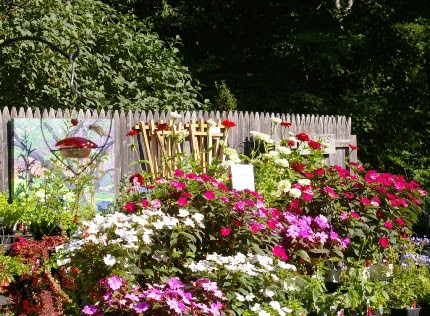 Behind it is a bench of beautiful annuals that are now on sale. Get in here for some colorful plants at a great price. They won’t last long. Check your plants for water, the thunderstorms we have been expecting have seemed to miss us lately. Deep soak any shrubs, trees, or perennials that you have planted this growing season. After digging in the earth on Sunday, even after it appeared to have rained a lot in the morning, I found the soil to be bone dry once I got past the surface. Feeding is also top of the list now too- containers need it for sure since the daily watering leaches out the nitrogen. But your veggies and annuals should be fed at least every couple of weeks to assure lots of flowers and fruit. If this week’s heat wave turns out to be as hot and intense as the weatherman promises, consider foliar feeding your gardens with Stress-X, which is liquid seaweed. This does wonders for your plants. Hot summer days are when liquid seaweed (kelp) is really the answer. Join me in the garden on Saturday morning for our newly renamed garden walks- we are now calling it Garden Summer School! 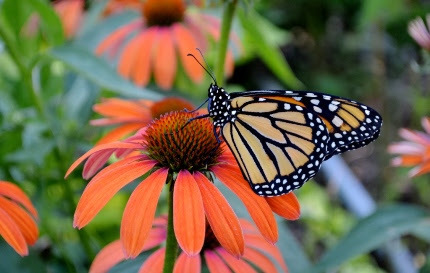 Come by and check out our monarch nursery and say “welcome to the world” to our newly hatched babies. We’re having fun this summer.